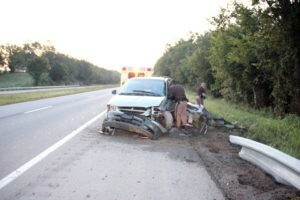 At 5:50 a.m. this morning Adair County Sheriff’s deputies Josh Durbin and Aaron Rainwater responded to the Louie B. Nunn Parkway where a 2000 Dodge Caravan being operated by Stefan Williams of Lewisburg KY was traveling east bound when he ran off the roadway and struck a guardrail. Williams was treated on scene by Adair County EMS and transported to T.J. Health Columbia where he was cited by Deputy Durbin for operating a motor vehicle underthe influence of drugs/alcohol. Stefan Williams was treated on the scene then transported to T.J. Health Columbia. At 8:30 this morning Deputy Aaron Rainwater was dispatched to the 44 mile marker of the Louie B. Nunn Parkway for a single vehicle accident with injuries. Paige Adams, 22 of Somerset was traveling west bound when she advised another vehicle forced her off the road. Adams struck an earth embankment and was trapped in the vehicle for approximately 15 minuets before being extricated by members of the Adair County Fire Department. Adams was treated on scene by Adair County EMS and transported to T.J. Health Columbia for further treatment. Adair County Sheriff’s Department was assisted on the scene by Adair County EMS and Adair County Fire Department. Paige Adams, of Somerset, was treated on the scene then transported to T.J. Health Columbia.